The product could cause illness if consumed raw. A BATCH OF grated coconut by food brand Buenas has been recalled in Ireland due to the detection of salmonella. The Food Standards Authority of Ireland has announced that UK importer Manning Impex Ltd has recalled the batch, which could cause illness if consumed raw. The product originates from the Philippines and is sold in a 454g pack. A notice will be displayed in shops that sold the implicated product, advising customers not to consume that batch. Salmonella is a bacteria that causes salmonellosis, an infection that can be severe and result in hospitalisation and sometimes death. It is usually caused by contaminated meat, eggs, or milk. The product was also recalled elsewhere, including Canada, the UK and the US state of California. Email “Product warning: 'Buenas' brand grated coconut recalled after salmonella detected”. 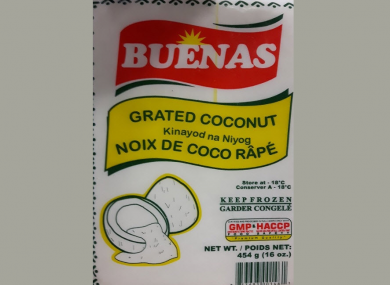 Feedback on “Product warning: 'Buenas' brand grated coconut recalled after salmonella detected”.